Nearly half of all clients in therapy have physical pain, yet for the majority of these individuals, their pain has no clear medical cause. This is particularly true for those with back and neck pain, headaches, fibromyalgia, and abdominal-pelvic pain. Neuroscientists now know that all pain is constructed by the brain’s alarm mechanism, which can be activated by either physical injury or perceived emotional threat. 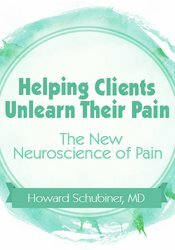 This workshop will provide tools and step-by-step techniques to help therapists simultaneously address physical and emotional pain. The following state psychologist boards recognize activities sponsored by PESI, Inc. as an approved ACCME provider: Alaska, Arkansas, California, Colorado, Georgia, Illinois, Indiana, Kentucky, Maine, Maryland, Missouri, Nebraska, Nevada, New Hampshire, New Jersey, New Mexico, Oklahoma, Pennsylvania, South Carolina and Wisconsin. This self-study activity consists of 2.0 clock hours of continuing education instruction. Certificates of attendance will be issued for you to submit to your state licensing board to recognize for continuing education credit. Full attendance is required; no partial credits will be offered for partial attendance. PESI, Inc. designates this enduring material for a maximum of 2.0 AMA PRA Category 1 Credit(s). Physicians should only claim credit commensurate with the extent of their participation in the activity. You are required to successfully complete and submit a post-test prior to receiving a certificate of completion.